play iTunes movies TV shows on Nook Tablet with ease. Move iTunes Movies and TV Shows to Nook Tablet, but Fail to Play? If you are iTunes users who want to play iTunes movies and TV shows on Nook Tablet, but find it impossible to play. You may not know that purchased or rented iTunes movies and TV shows are DRM protected. Apple will not allow you play them on non-Apple devices. So you have other Andorid devices, they can not play them either. Then is there any method to make it work? Keep reading, you will find answer here. How to Play iTunes Movies on Nook Tablet? It is DRM protection that prevent you from playing iTunes videos on Nook Tablet and other non-Apple devices. If you can free iTunes movies TV shows from DRM and convert them to Nook Tablet supported formats, you can play them successfully. There are some iTunes DRM removals in the market. The most popular one is NoteBurner M4V Converter Plus. Also you can find some video recorder prorgams to record the iTunes video down to get normal output video file. But in this way, the video quality will be poor. The 5.1 surround audio and subtitles can not be preserved. So we suggest you try NoteBurner M4V Converter Plus. It is the best tool to do this job. NoteBurner M4V Converter Plus (For Mac & For Windows) adopts an innovative DRM decrypting technique which makes it possible to unlock iTunes DRM videos with lossless video and audio quality. It will help you to directly crack the DRM iTunes video and convert both iTunes purchased and rented videos to Nook Tablet supported formats with AC3 dolby 5.1 surround audio and Closed Captions/subtitles preserved. Plus, if you like renting movies from iTunes, you can use it to keep iTunes rentals forever! 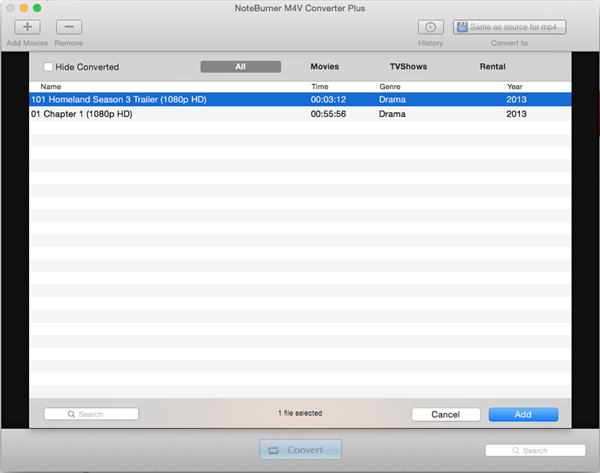 The following is a detailed tutorial about how to convert purchased or rented iTunes movies/TV shows to Nook Tablet using NoteBurner M4V Converter Plus. Please download this useful tool on your Mac pc or Windows PC first before getting started. When finish customization, click on the Convert button at the bottom to start the conversion. There will pop up a window for you to choose output location. Check Open folder when conversion completed and click Start to start the video conversion. Then you just need to wait till the conversion completed. When the conversion done, iTunes movies and TV shows are no different from other local video files. You can transfer them to Nook Tablet for playing with ease ! 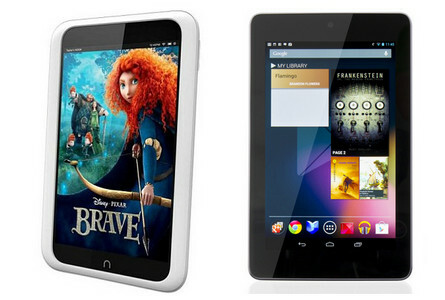 The Nook Tablet from Barnes & Noble features a low-glare ("fully laminated") 7-inch IPS LCD touchscreen display from LG, 16GB of internal storage, and 1GB of RAM. Its primary competition is Amazon's Kindle Fire, which costs $50 less. This tablet is more than just a high-end e-Reader because it boasts a great collection of educational apps and games which are expandable to 4GB. Some other great features include Wi-Fi capability, parental controls and support for many file formats. Speaking of file format, the Nook Tablet supports a lot including the MP4, 3BP, Adobe Flash Player, WEBM and3 G2 MKV video formats, plus the MP3, AAC, MP4, AMR, OGG and WAV audio formats. What's next? Download NoteBurner iTunes Movie to Nook Tablet Converter now!